A unusual Anglocentric perspective illustrating the vast potential of British colonial expansionism in North America. A fascinating 1747 map of North America drawn by the British cartographer Emanuel Bowen shortly before the outbreak of the French and Indian War. Bowen's map covers most of the modern day United States from the Rio Grande to the Pacific and from Lake Superior to the Gulf of Mexico. River systems are well delineated and forests and topography and rendered in profile. Numerous American Indian nations, as well as colonial settlements, fortifications, and trading posts are noted throughout. As Bowen notes in a curios annotation appearing in the lower left quadrant, this map is essentially a remake of Bellin's map of 1744 from a highly Anglocentric perspective. Unlike Bellin's map, here there are no political borders; instead, what is represented is the vast potential of British of British sovereignty in America from the Rio Grande to the Atlantic and the Great Lakes to Florida - mostly through expansion into and cooption of American Indian lands, which here are addressed thoroughly. The escalating tensions between the relatively few French settlers in the Mississippi and the populous Atlantic colonies of the British would soon lead to increasing encroachment on overlapping claims and, eventually, in 1754, the French and Indian War. Though a significant advancement over many previous maps, the present examples is not without errors. Two in particular bear note and are derived directly from the Bellin / Charlevoix maps. These include Charlevoix's four fictional islands in Lake Superior - this being among the first British maps to present them - and the distended northerly mapping of the Rio Grande copied from Bellin, who based his map on De L'Isle. Four fictive islands appear in Lake Superior: Philippeux, Pontchartrain, Maurepas, and St. Anne. These islands were invented three years earlier by the French historian and traveler Charlevoix, then subsequently immortalized by the cartographer Jacques-Nicholas Bellin. The islands were intended to honor Charlevoix' s personal patron, the Count of Maurepas, Jean-Frederic Phelypeaux. The largest of the three islands, Philippeaux, is named directly after the count. The second largest island, Pontchartrain, refers to Phelypeaux's family estate. The third island, which may in fact be a mismapping of the factual State Islands, is named after the count's seat, Maurepas. The fourth and smallest of the islands, St. Anne, references the count's patron saint. Charlevoix described the islands as being rich in minerals leading numerous explorers to search for them in vain. Bellin dutifully introduced the four islands to his map, and such was his influence that they were subsequently copied by most subsequent cartographers, including John Mitchell in his seminal 1755 wall map of North America. The highly regarded Mitchell map was used in negotiating the 1783 Treaty of Paris that formally concluded the American Revolutionary War. Therein, the apocryphal Philippeaux was assigned as a marker for the new United States - British America border thus setting the stage for later political strife. With regard to the regions to the west of the Appalachian Mountains, Bowen draws directly from Bellin, rarely even bothering to translate Bellin's French text. What Bowen may not have realized is that, Like the De L'Isle map before it, Bellin's map was a profoundly French production indicative of both the sophistication of 18th century French cartography and influence of French political ideologies on mapmaking. As in Bellin's map, this map's largest text block reads 'Louisiana' and fills the center of the map, a clear expression of French dominance over northern marking and marking a strong contract to the comparatively meager British coastal holdings. On the opposite side of the continent French dominion extends as far as the Riviere du Nord (Rio Grande), including all of Texas and parts of modern day New Mexico - claims associated with La Salle's explorations and colonization of the Gulf Coast in 1685 (these claims, incidentally, led to 19th century U.S. Claims on Texas associated with the Louisiana's Purchase). Detailed identification of hundreds of American Indian nations and settlements throughout the territory, mostly along known river courses, further illustrate France's paternal and comparatively peaceable approach to New World Indian relations, commerce, and colonization. The contrast is partially noteworthy with regard to the English territories to the east of the Appellation Mountains where few American Indian settlements are noted. Bowen was less slavish in addressing the British colonies along the eastern coast. From Florida to New England Bowen presents a wealth of new geographical information no doubt extracted from Board of Trade memorandums and surveys. All along the seaboard Bowen has added a wealth of new place names, often replacing Bellin's older French names, some dating from the 16th century, with updated English names. Bowen drew this map for publication in his Complete System of Geography. Bowen, E., A complete system of geography. Being a description of all the countries, islands, cities, chief towns, harbours, lakes, and rivers, mountains, mines, & c. of the known world …, (London) 1747. Very good. Original centerfold. Blank on verso. Minor closed repair, right margin. Rumsey 3733.058. Wheat, C. I., Mapping of the Transmississippi West, 1540 – 1861, 122 (1745 ed.). Phillips (Atlases) #603-2-58 (1752 ed.). National Maritim Museum, Catalogue of the Library, p.356. 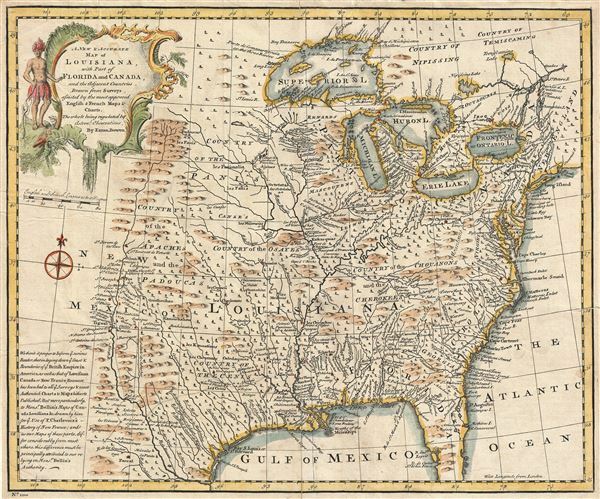 Lowery, W., The Lowery Collection: A Descriptive List of Maps of the Spanish Possessions witin the Present Limits of the United States, 1502-1820, 401 (1752 ed.). Library of Congress, Map Division, G3300 1752 .B6. Lemmon, A., Magill, J., and Wiese, R., Charting Louisiana: Five Hundred Years of Maps, #25.